Jean Jun Oe Chun Lee, the daughter of Helen Kon Gnit Lau and James Sau Nam Chun, was born on July 20, 1931. She was delivered by her father on the premises of the Wahiawa Water Company, a bookkeeper at the company. She had four older siblings: James Chun, Marian Chuck, Cynthia Kui Yin Chun Ching, and Lawrence Fook On Chun. Jean graduated from the University of Hawaii with a B.A. in Social Work, and in 1954, married Howard Jan Tong Lee, the son of Flora Yuk Ing Wong and Kam Poo Lee. They had four children: Carolyn J. Lee (Matt Heim); H. Randall (Amy) Lee; Janet (Thomas) Witten; and Wendy (Carl) Akai. Jean enjoyed gardening, making jelly, beading, decorating for Christmas, baking cookies for everyone, playing golf with friends, traveling with family, and most of all spoiling her grandchildren: Samantha Jean Lee; Grant Howard Silverberg; Cassidy Starr Witten; Sidney Ann Lee; Carson Kaulana Akai; and Kenzie Jean Lee. She had the good fortune to spend her later years living next to her beloved sister Cynthia at Kahala Nui. The family is grateful to the staff at Kahala Nui for helping her to discover a love for hula and painting, and for caring for her with aloha. Jean passed away peacefully on May 30, 2018 in Honolulu. She is survived by her husband, children, grandchildren, and sister Marian Chuck. The family will hold a service for Jean at Waialae Country Club on July 26, 2018, Thursday: 10 a.m. reception; 11 a.m. service; lunch to follow. 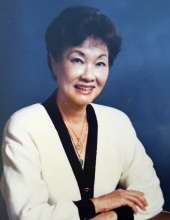 In lieu of flowers or gifts, charitable donations can be made in Memory of Jean C. Lee to Kahala Nui, an IRS501(c)3 nonprofit organization, at 4389 Malia Street, Honolulu, HI 96816. To send flowers or a remembrance gift to the family of JEAN JUN OE CHUN LEE, please visit our Tribute Store. "Email Address" would like to share the life celebration of JEAN JUN OE CHUN LEE. Click on the "link" to go to share a favorite memory or leave a condolence message for the family.